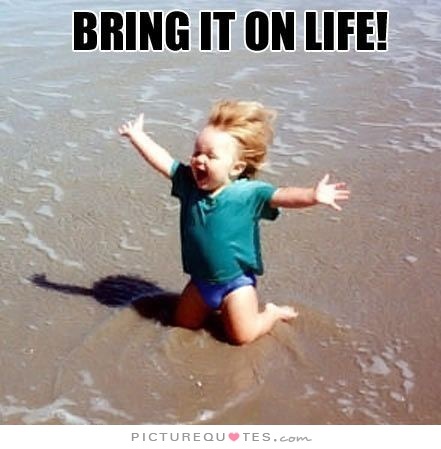 The best way to deal with Life is to have the “bring-it-on-I-guess-we-can-handle-this” attitude! Sometimes, Life can be very unsettling. Just when you have been dealt one blow, a few more punches will be hurled at you. Roll with the punches. There is no other way. If you start asking why, why me or cry foul or scream “hey, gimme me a break!”, you will end up suffering – in addition to having to deal with the pain. Indeed this is so true – for each of us, in our given Life contexts and situations. You can rave and rant. You can kick and stomp. But Life is not going to get any easier or better just because you are upset with what you have been dealt with. I have come to conclude that the magnitude of the problems you are faced with is directly proportional to Life’s assessment of your ability to face them and endure them. Life is like a gym trainer who is intent on increasing your ability to lift weights on a weekly or monthly basis. Yes, lifting those weights can be tough, painful and impossible at times. But ultimately they build your strength. Once you have endured a quantum of weights you can handle those weights easily. And the more you lift, the better, and stronger, you get. Your suffering is an outcome of your wishing that your Life is different from what it is. So, instead of simply wishing, tell Life, to use Punjabi slang, “Aan De – Bring it on!” And you will soon realize, like I have, that you can always handle everything that comes your way – no matter how impossible it seems at first!